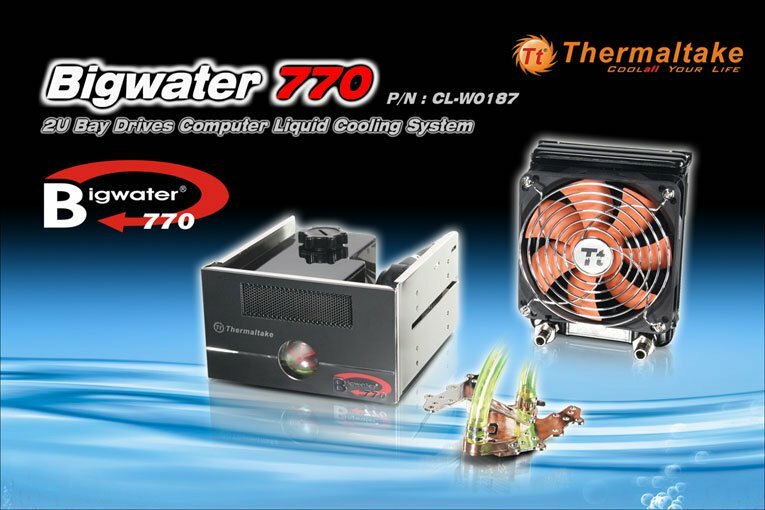 July, 2008 – After the successful launch of the Bigwater 760i liquid cooling system in 2007; Thermaltake is releasing the new Bigwater 770 to fulfill more demands of DIY players this year! Keeping the easy installation and space saving advantages of Bigwater 760i, Bigwater 770 also allows extremely easy installation process using the front 5.25” expansion bays and intelligent interconnect for tubes; None will need to worry about the difficulties and mess caused by traditional liquid cooling systems anymore. And now with Bigwater 770, you can even fit the liquid cooling system in your middle tower chassis! Bigwater 770 has included the all cooper waterblock design with the best heat conductivity that is also suitable for high temperature welding. Adding the high quality production technology from Thermaltake, you will not need to worry about leakage problems under long operation hours. The Redundant Micro Channel Design within the waterblock effectively divides water flow into micro channels thus accelerating heat transfer from the heat source. Other thoughtful designs on Bigwater 770 include the intelligent interconnect with the built-in automatic shut-off valves preventing accidental water leakage during assembly and dismounting; the strong P500 pump pushing 500L/H (131.9G/H) of water to further increase the thermal efficiency of Bigwater 770 and allows powerful operation even with extra upgrading components. The durable ceramic bearing mechanism on the other hand ensures years of uninterrupted operation of the pump. And the radiator too, were equipped with the new Dimple Tube Technology to increase the turbulence within the radiator, effectively enlarging the surface area of coolant contact and elongating the time that the coolant stays in the radiator to be cooled. Bigwater 770 guarantees a high quality, high performance and high reliability liquid cooling system; and now even fitting with middle tower chassis. With the Thermaltake exclusive drive bay liquid cooling series, you no longer need to worry about the complicated installation and limited space!! Check out more now at the official website!